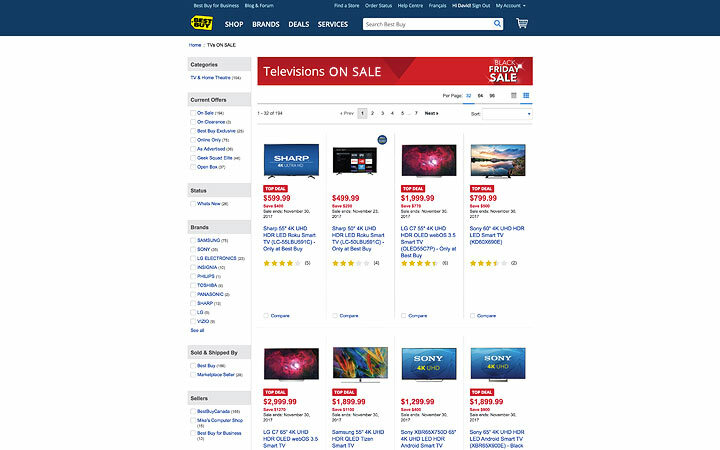 As a Digital Experience Designer, I’m responsible for crafting the customer-facing experience on BestBuy.ca, and across all of their other digital platforms. Working in an agile environment with Business Specialists, UX Architects, Developers, and Product Owners, I have the opportunity to strategize and deliver high-quality design solutions that also meet eCommerce business objectives. Koala is an in-house brand that sells bed-in-a-box mattresses. They also offer an entire collection of complimentary products like pillows, toppers, and foundations that are all compatible with each other. 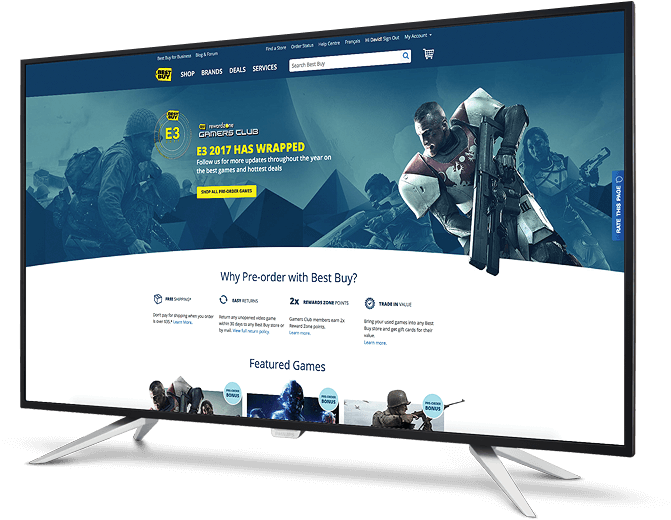 The task was to launch the brand, and build a shopping experience for a new type of product that Best Buy has never carried before. So as a customer, I would like to understand the unique value props of Koala, and easily shop all of their products. We met with our stakeholders and went through an extensive research phase to get a sense of the competitive landscape and better understand their business objectives. What we learned was that the popularity of bed-in-a-box has grown tremendously in the last few years because of its convenience. There's no need to visit a sales floor – you can order a mattress in the comfort of your own home, and it’s shipped to your door in a small, standard delivery box. With furniture being one of Best Buy's highest performing growth categories, we now have the opportunity to be one of the few retailers in Canada who offer this product, along with the great customer experience that comes with it. In order to be successful, we need to help build brand awareness and create an experience that presents the entire product line to the customer. Working with Business Specialists, UX Architects, Content Strategists, and Copywriters, we had a kick-off meeting that revolved around one question: what’s the message that we want to communicate to customers? 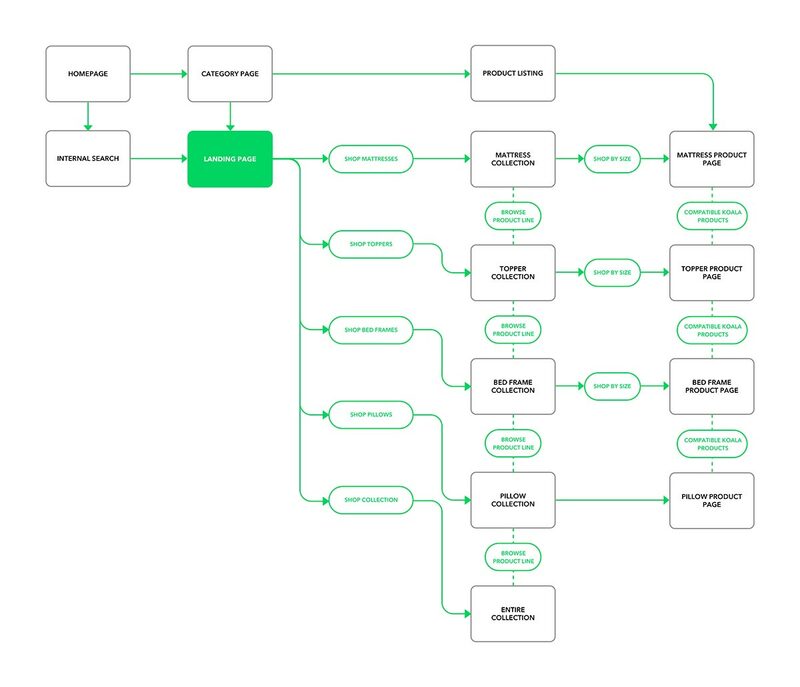 We then mapped out the user flow that a customer can go through if they wanted to find a Koala product on the website. We identified customers who would navigate through our category pages, use the Search feature, or land anywhere in the journey through SEO. This helped inform our decisions on where to place the right messaging, at the right time. While working on this flow, we quickly realized that there was a need for a landing page. Because this is a new brand and a new product, the ultimate goal was to be as educational as possible. In order to communicate everything that Koala had to offer, we needed a centralized hub that conveyed all of this information. We also wanted to leverage high-quality content to build trust and confidence in the brand. For the customer, this is their introduction to the Koala brand. To build this experience, I used a number of different UI components to tell the story. 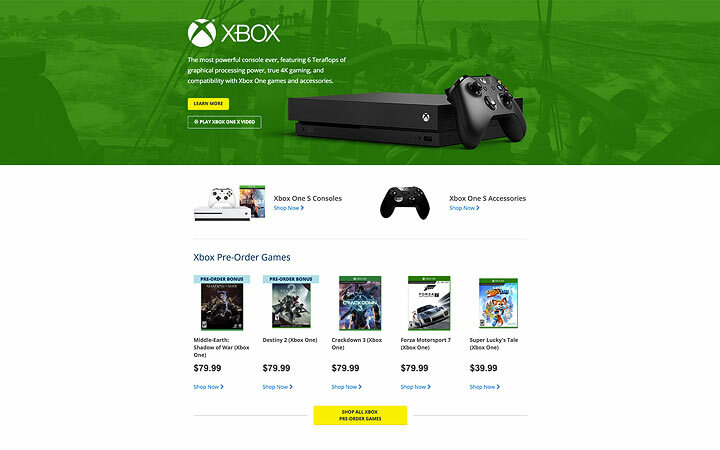 Used to showcase the product with a rich background image and descriptive text. This is could be the first time that the customer interacts with the brand, and we want the primary message to quickly describe what Koala is. Used to clearly communicate important information. In this case, it highlights Koala’s three main value props, which were originally defined in our kick-off meeting. Used to provide additional information along with a supporting image. This is an educational section that explains bed-in-a-box for those who might not understand what it is. Used to tell a powerful story on the page with strong imagery. This section describes each product and allows the customer to explore the entire collection. 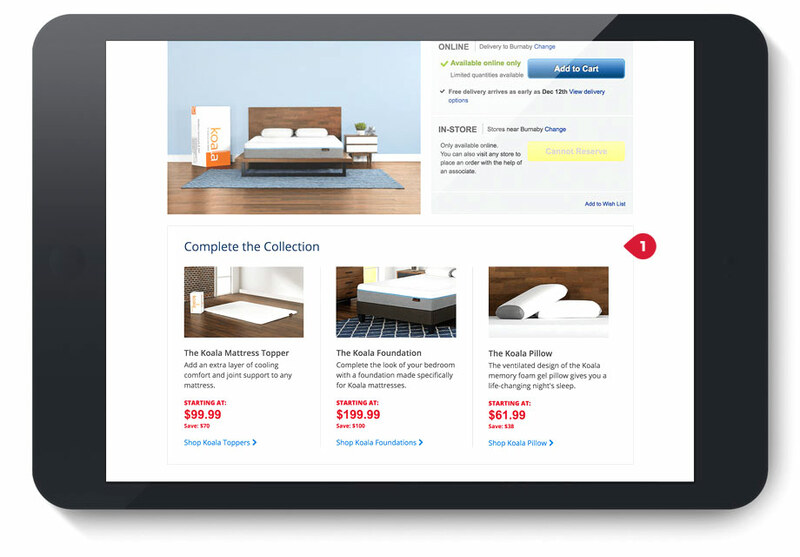 We also built an intermediary path from the landing page to the product page with navigational components to help customers find the right size mattress that they’re looking for. 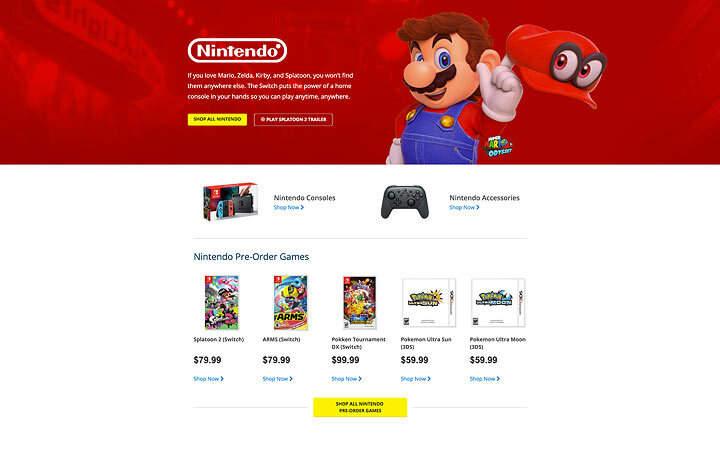 Used to help narrow down the number of products on the page. It allows the customer to filter their results by mattress size. Used to navigate to other categories. This enables the customer to easily browse other Koala products. On each product page, we wanted to promote related Koala products and encourage customers to complete their bedroom. Used to recommend related products that the customer might also be interested in. Since the launch, Koala mattresses make up a large portion of the total sales in the Mattresses department. 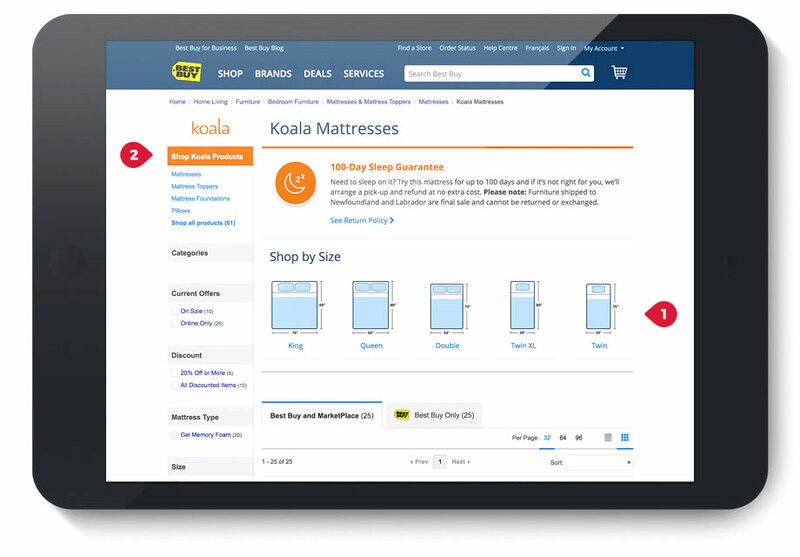 While Best Buy offers hundreds of different brands, Koala is already one of the highest purchased brands in the category – only behind specialty brands like Sealy. Customers who end up hitting the landing page are more likely to make a purchase. However, traffic to this page is relatively low due to the limited number of touchpoints. There is high engagement with the “Complete your collection” component that was built on the product display page, which lead to an increased product attachment rate for foundations. 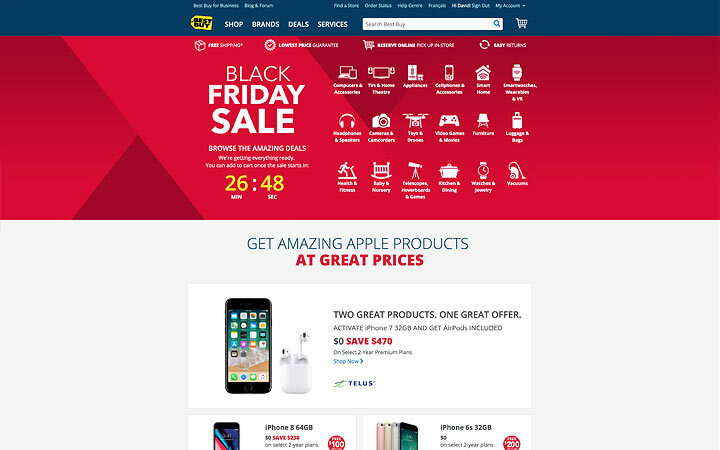 Being one of Canada’s largest online retailers, Best Buy strives to offer the best online shopping experience for customers who shop during high-traffic periods like Black Friday. While leading the visual design online, our team was able to craft the entire shopping experience from start to finish. 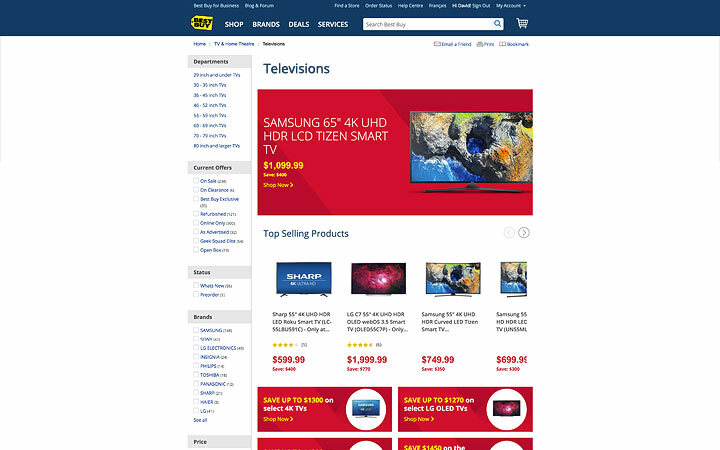 Using UX principles and data analytics, we identified the purpose of each page in a customer's journey, and built promotional & navigational components that were used across the entire website – making it easy for the customer to find the right product. The Electronic Entertainment Expo (E3) is the world's premier event for anything video game related. This three-day event is where ground-breaking technologies and products are showcased, and connects thousands of the best and brightest from leading-edge companies in the entertainment industry. 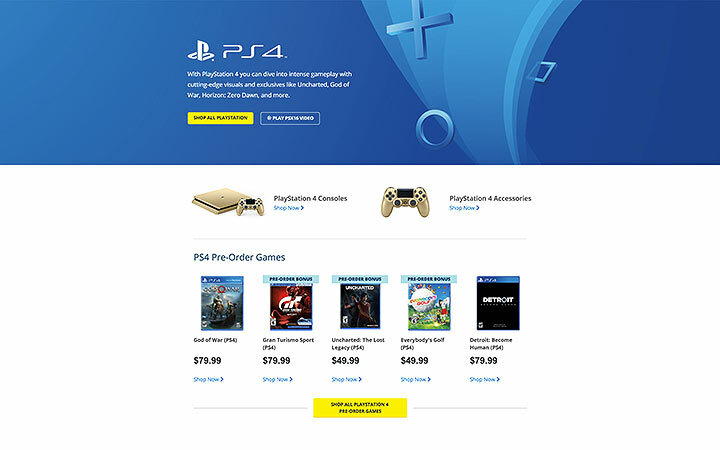 Best Buy has a dedicated E3 landing page that aims to educate customers on these innovative products as they are announced, and how they can get their hands on these new products. 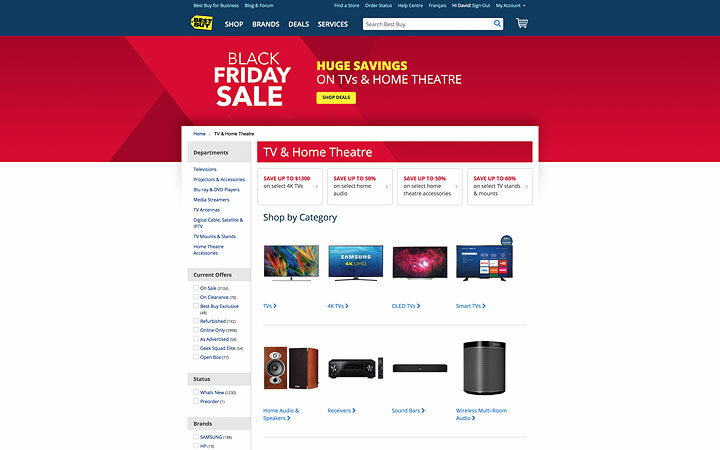 By working with UX, Business & Marketing Specialists while leveraging the Best Buy brand, our team was able able to create an extensive marketing plan that secured hundreds of thousands in vendor funding.